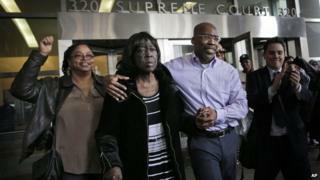 A New York man has been exonerated over a 1989 murder as part of larger review of questionable convictions. Jonathan Fleming, now 51, had been on holiday in Disney World at the time of the murder and had documents supporting his alibi, but he was still convicted. Since then, a key eyewitness has recanted and prosecutors turned up a hotel receipt proving he was in Florida hours before the killing. "I feel wonderful," Mr Fleming said after a judge dismissed his case. "I've always had faith," he said. "I knew that this day would come some day." He had told officials from the start he had been in Florida when Darryl Rush was killed in Brooklyn in 1989. Prosecutors argued the shooting was motivated by a dispute over money. He had plane tickets, videos and postcards from his trip, but prosecutors at the time suggested he could have made a quick round-trip plane trip to return to New York. Despite a key witness saying she had lied soon after his 1990 conviction, he had lost his previous appeals. A review of the case files produced a hotel receipt Mr Fleming paid in Florida five hours before the shooting and a letter from Orlando police saying employees at the hotel remembered him. Neither the receipt nor the police letter had been provided to Mr Fleming's first defence lawyer, despite rules that generally require investigators to turn over such material. Brooklyn District Attorney Kenneth Thompson said in a statement he had dropped the case against Mr Fleming because of "key alibi facts that place Fleming in Florida at the time of the murder". The move comes amid scrutiny of Brooklyn prosecutors' process for reviewing questionable convictions, led in part by Mr Thompson, who was elected last year. When Mr Fleming was asked about his plans, he said: "I'm going to go eat dinner with my mother and my family, and I'm going to live the rest of my life."